How About Green Renovations in Existing U.S. Schools? Want to get in front of ASID leadership? Sponsor CLC 2009! The 2009 ASID Chapter Leadership Conference (CLC) is the Society's annual leadership development conference that is attended by all 400 chapter board members, student leaders and student chapter presidents together representing 40,000 members across every demographic ASID serves. For more information visit the ASID CLC Web page or contact our sponsorship manager, Diane Ainge, at dainge@asid.org. Grange’s new Velum outdoor collection features charcoal and tan weather-safe resin rattan woven on faux-finished bamboo aluminum frames. 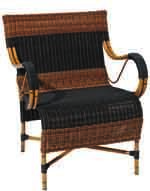 The Velum collection has the feel of real wicker and bamboo and is impervious to the elements. It is safe to use by the pool or at the beach without fading and is 100% non-toxic and 100% recyclable. Visit www.grange.fr or call 1.800.GRANGE1 to learn more. Coast To Coast Leather introduces their ECO line with the Genuine "GREEN" Leather. High quality, full grain, Italian hides that provides the "True Wet White" tanning process. The hand is magnificently soft in a natural way. This product also is water and stain resistant. Available in half hides.